The U.S. President signed the BABIES Act on Friday. 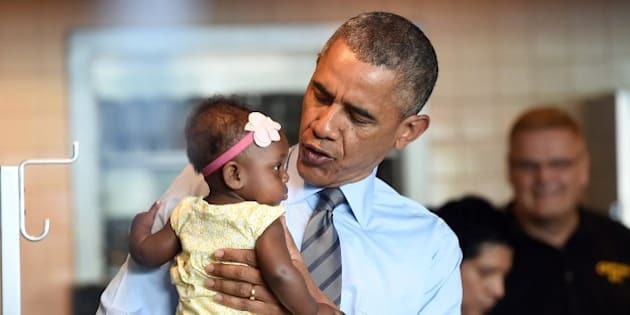 Thanks to U.S. President Barack Obama, dads are getting baby changing tables in their restrooms, too. On Friday, Obama signed the BABIES Act, which requires all public federal buildings, such as courthouses and post offices, to include baby changing stations in both women and men’s washrooms. According to the new legislation, these change tables must be added within the next two years. The BABIES Act, also known as the Bathrooms Accessible in Every Situation Act, was proposed in April by Congressmen David N. Cicilline. The new legislation is significant as an increasing number of men in the U.S. are choosing to be stay-at-home dads, making the need for change tables in men’s washrooms even more apparent. Not only that, but it’s a simple fact that dads change diapers, too. The lack of change tables in men’s washrooms has always been an issue in the U.S. However, last year, Ashton Kutcher brought the topic to the forefront when he vented his frustrations on Facebook, just five months after his daughter, Wyatt Isabelle, was born. His post quickly caught the attention of dads everywhere who could relate to the situation. Soon after, the 38-year-old started a petition on Change.org to encourage more stores to provide change tables in men’s washrooms. “If Target and Costco take this step, I know that other companies will follow suit and recognize that we should be supporting all parents equally,” he wrote. Kutcher, who is a dad to two-year-old Wyatt and is expecting one on the way, also told his website, A+, that he hopes dads will be given the same rights as moms. Similarly, in Canada, women have also petitioned to make change tables mandatory in all public restrooms for both men and women. According to the Toronto Sun, only family washrooms in new establishments require change tables. However, older establishments constructed before 2015 do not.